For various reasons, it has been quite some time since I last blogged here on ShukerNature. But for many other reasons, which have illuminated my life during the past 24 hours due to the kindness of friends, I realise that it is high time that I did, so here goes. Due to its specific subject, I would like to dedicate this ShukerNature article to one of those friends in particular, as I know that it has been an interest of hers since an early age. And so, Emma Marie, this is for you. It is rare that a blatant zoological impossibility is not only captured alive but is also placed on public display. Yet during 1909 in Philadelphia, USA, this is precisely what happened...sort of. 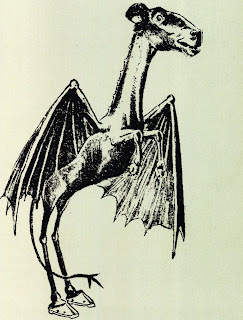 One of the most bizarre and baffling mystery beasts documented in the annals of cryptozoology must surely be the Jersey devil (aka the Leeds devil - according to one yarn, it was supposedly the monstrous offspring of Mother Leeds, a reputed New Jersey witch, after she had been impregnated by the devil in 1735). 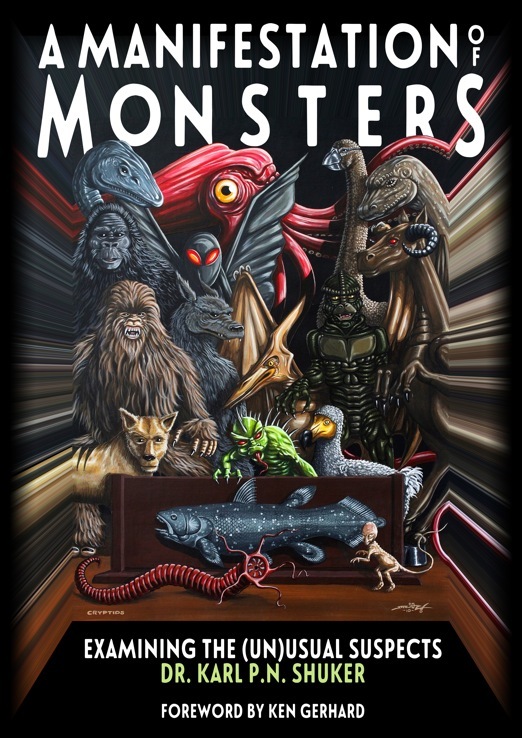 Alleged sightings of this creature date back as far as the 18th Century, and most commonly occur within an extensive, heavily-forested area of coastal plain stretching across seven counties in southern New Jersey, known as the Pine Barrens. 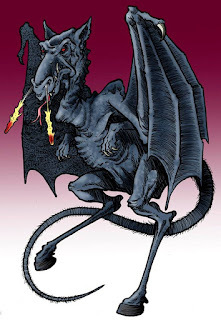 However, there have also been reports emanating from areas far beyond this epicentre – especially during a major 'flap' or outbreak of Jersey devil activity that took place during January 1909, and which stretched as far as Pennsylvania, Delaware, and Maryland. 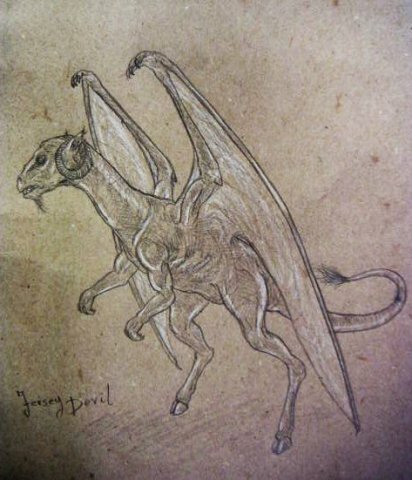 The creature itself, widely blamed for livestock killings and other depredations, has been described in many different ways, but was generally accorded a pair of leathery, bat-like wings, as well as four limbs (with the clawed front limbs much shorter than the cloven-hoofed hind ones). It was also said to be bipedal, and was often claimed to sport a horse-like head but bearing a pair of ram's horns, a long forked tail, and flashing red eyes. In some encounters, the eyewitnesses alleged that it had emitted a loud blood-curdling scream. Needless to say, from a zoological standpoint such a creature is an anatomical nonsense, as scientists and other wildlife experts have always steadfastly maintained – thus suggesting that if the Jersey devil is indeed real, it is very different (and far more prosaic) than the evidently much-exaggerated, greatly-embroidered versions that have been claimed by some eyewitnesses down through the ages. 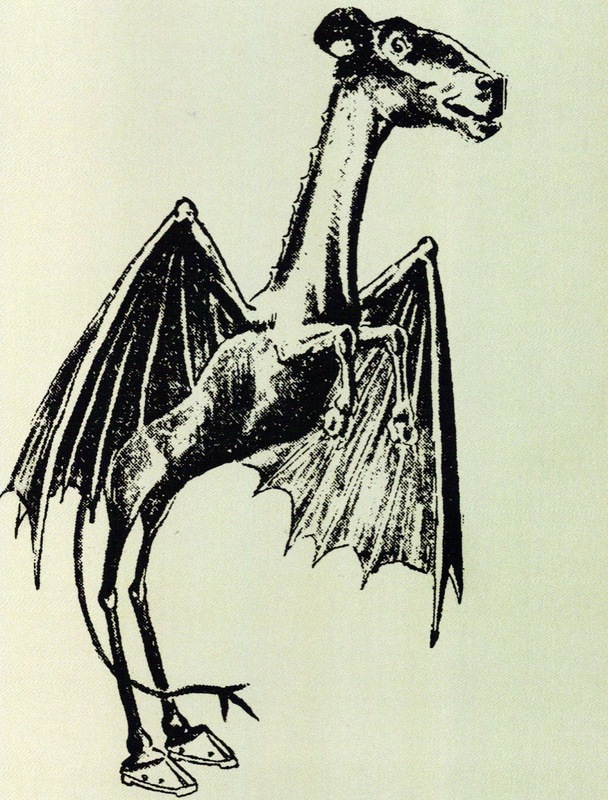 Nevertheless, this did not prevent a pair of very canny entrepreneurs from cashing in on the Jersey devil frenzy that took hold during 1909 with what proved to be a very lucrative if entirely fraudulent exhibition purporting to display no less extraordinary an entity than a bona fide, recently-captured, and still very much alive specimen of this sensational(ised) mystery creature. During the early 20th Century, Philadelphia in Pennsylvania was home to T.F. Hopkins's Ninth and Arch Street Museum, but by the onset of 1909 it was suffering from falling attendances. Anxious to reverse this worrying trend, Norman Jefferies, the museum's publicity manager, hatched a mutually beneficial scheme with animal trainer Jacob F. Hope, one that would boost the museum's popularity and also be financially remunerative to Hope in exchange for his assistance. 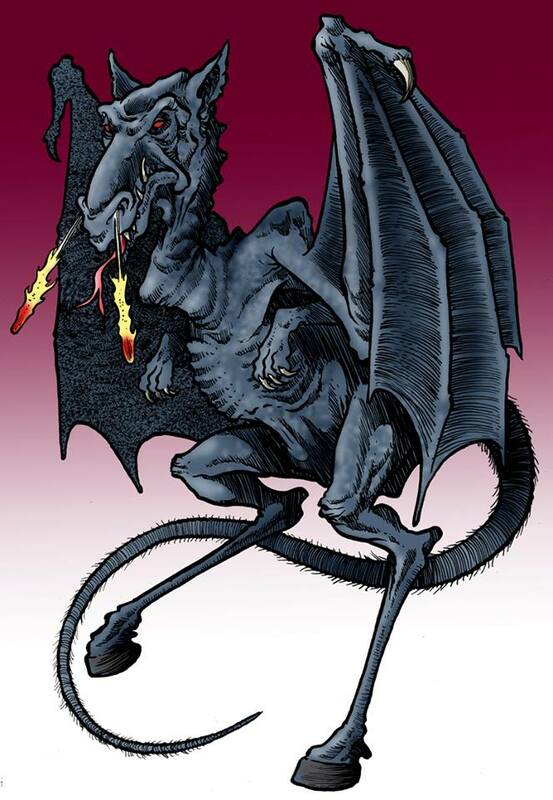 As concocted by Jefferies and Hope, a certain story was duly made public about how an extraordinary - and extremely bloodthirsty - animal known as an Australian vampire, formerly in Hope's possession, had recently escaped, and how it was this creature that had been responsible for the bizarre Jersey devil sightings reported in the eastern Pennsylvania/southern New Jersey region during that same time period. Happily, however, according once again to their story, this creature had now been recaptured alive and unharmed, and would be put on display by the museum where it could be seen by one and all, for a viewing fee of course. 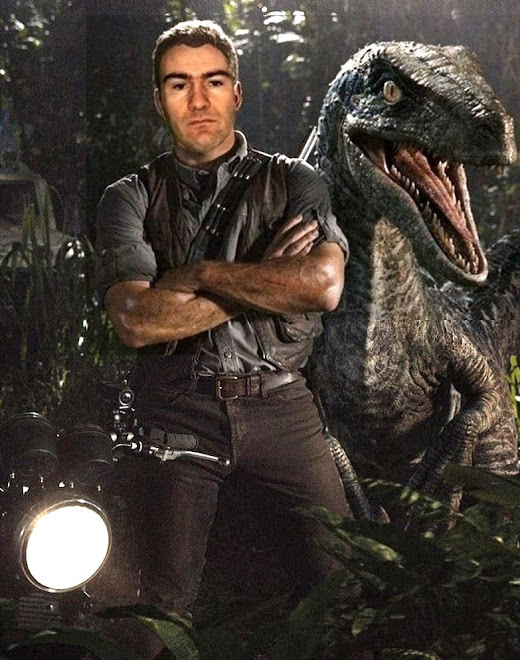 To substantiate this claim, Hope had arranged for a team of a dozen or so specially-hired men who were part of the hoax and acted out the role of trained animal handlers, armed with nets and other implements, to venture forth into a local park one night where the creature was supposedly on the loose, and capture it there. This was duly accomplished when one of the men, perched in a tree, dropped a net over the animal when it passed by underneath. Interested outside observers who may have suspected a fraud had they directly witnessed what was happening were kept outside by a fence ringing the entire park, which was also closed to the public at night anyway. And what was this ferocious 'Australian vampire' that they had captured in the park? In reality, it was nothing more alarming than a large male red kangaroo Macropus rufus that Jefferies had obtained earlier from a New York animal-dealer colleague and had then 'transformed' into the greatly-feared Aussie mystery beast. This transformation consisted of Jefferies painting a series of vivid green stripes upon its red fur and attaching to its shoulders a pair of lightweight artificial wings, manufactured from thin bronze and covered with rabbit fur. It had then been secretly taken to the park by its supposed pursuers and quietly released there, after which they had promptly – and publicly - recaptured it. A massive steel cage placed inside the museum's cellar was then set up by Jefferies as the location for his unique specimen's exhibition. Dimly lit, temporarily hidden from outside view by a dropped curtain, and with a gruesome collection of chewed bones strewn across the floor, this was the melodramatic scene in which the creature would take centre stage. Unfortunately, however, the kangaroo did not like its surroundings, and refused to cooperate by putting on any kind of show when tried out by Jefferies in advance of admitting any paying visitors. So he arranged for a boy armed with a long stick bearing a sharp nail at its end to lurk hidden amidst the shadows at the back of the cage. As soon as the visitors came in and the curtain rose, the boy would poke the kangaroo surreptitiously with the nailed stick, causing it to leap forward shrieking, its false wings flailing, scaring its audience for an instant before the curtain came down. The shocked audience would then leave, the next visitors would enter, the curtain would rise, and the same brief scene would be enacted all over again, and again, and again – because the exhibition proved very popular, generating much-needed increased takings for the museum, and presumably a handsome payment for Hope too. Only the poor frightened kangaroo, tormented by the nail-embedded stick and confronted by gawping, screaming audiences, gained nothing from the tawdry proceedings. And how do we know all of this? In 1929, Jefferies publicly confessed to the whole squalid charade. 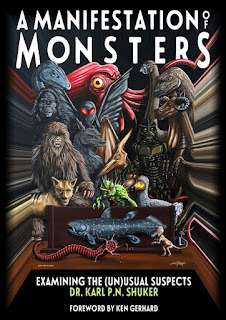 This ShukerNature blog article is excerpted from my book A Manifestation of Monsters. Sorry for your reasons. Glad to have you back. Your return is most welcome. I've missed your articles for some time.